Don't run yet, this is not another Baywatch incarnation. 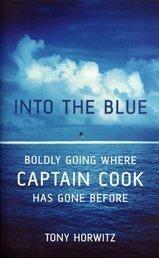 The book's full title is much more revealing (and appealing, too): Into the Blue - Boldly Going Where Captain Cook Has Gone Before. Rather longish, but self-explanatory. There have been many books like that - an author chooses his interest, travels worldwide doing research (expenses presumably paid) and writes a report from his journeys in the book form. A brilliant idea if I've ever seen one! In this particular instance, captain James Cook is the interest and travels include some rather smashing destinations - Tahiti, Hawaii, Tonga, Alaska and others. I keep promising myself that one day I will write a book like that, too. I might sound slightly sarcastic, but the book was actually quite alright. Smoothly written, dynamic, funny - and it got better as it progressed. I don't see much merit in reporting the state of monuments to Cook's memory worldwide (which is usually pretty poor and monuments are fakes anyway) but the body of information on the brave Captain was sound and interesting and overall it's a pleasant way of ingesting some history. Nothing life-changing but still - light, easy and pleasant. And sometimes this is exactly what's needed.